For thousands of years, the human brain has been hard-wired to make split-second decisions based on the information immediately available to it. For our ancestors, these snap choices between risk and reward may have meant the difference between life and death. Whilst rarely so life-threatening, our decision making is still vastly affected by our instincts and emotions. These emotions can often be detrimental to investors who would be better served by ignoring short term volatility and to focus on longer term trends. However, as the brain instinctively values immediate gains and losses, this is easier said than done. Understanding what is happening in our brains throughout the decision making process makes it easier to be governed by reason rather than emotion. The brain is not ‘designed’ with investing in mind. The brain is split into different parts, each with its own function. The Prefrontal Cortex consists of two areas, one that processes potential reward and the other potential risk. It is responsible for the ability of investors to weigh risk vs return. The Amygdala controls feelings of fear (adrenaline) and the fight or flight response which can induce panic when markets take a turn for the worse. The Hippocampus is the part of the brain accountable for long term memories. It can cause ‘behavioural bias’ as investors tend to feel and remember losses twice as acutely as gains. Finally, the Nuclei Accumbens acts as the brain’s reward centre. It is responsible for happiness and can lead an investor to make mistakes if acting exclusively under its influence. These parts of the brain all work together, but they are not ‘designed’ with investing in mind. We’re conditioned to place greater emphasis on the present rather than the future. The pain derived from losses in the short term is often perceived to be greater than the likelihood of the markets turning around – which can lead to some rash decision making in the face of market downturns. An investor might sell all their holdings to remove themselves from this worry. Doing so in great numbers is called capitulation and ironically is often the beginning of the forthcoming recovery, even the next bull market. Whilst this selling reflex is not inherently wrong, as it may prevent further losses, not knowing when to re-invest often causes investors to regret their decision. The markets’ worst days are often shortly followed by their best, or as Charles Dickens more eloquently puts it: “positive and negative things in life are hard to separate”. The graph below helps to illustrate how investors lose out when they let their emotions take over. The red line shows the performance of a ‘balanced’ portfolio. The grey bars show the net purchases and sales of ‘balanced’ funds in the UK. Between Jan ‘06 and Jan ‘08, the balanced portfolio steadily increases in value which motivates regular purchases of balanced funds. In Jan ’08 the markets start to decline. Initially there is little selling activity but as the losses deepen, the volume of funds sold increases. The selling peaks between Sep ’08 and Mar ’09 when losses and panic are at their greatest – the point of capitulation. While it is true that those selling at the peak of negative fund flows in Sep ’08 would miss further losses in the short term, it is also likely that the majority missed even greater gains when the recovery started in Mar ’09. 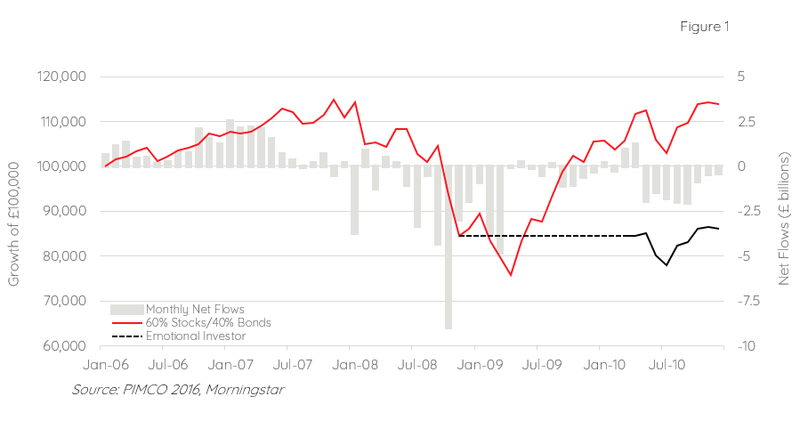 The net selling of balanced funds continued throughout the entire period of recovery of the balanced portfolio, with net buying of funds only returning when the balanced portfolio has returned near to its previous peak. The emotional investor in this example sells in Nov ’08, in the middle of the period of peak selling, and buys back only when there are obvious net inflows back into the market. This shows how the impact of emotional decision-making can be disastrous. By the end of 2010, the emotional investor’s original £100,000 is now worth c. £86,000. Had they left it untouched, it would be worth c. £114,000. The emotional investor is now c. £28,000 or 30% behind where they would have been had they simply stayed the course. Based on the same level of performance between Jan ’06 and Dec ’10, this would take over 10 years to recoup. 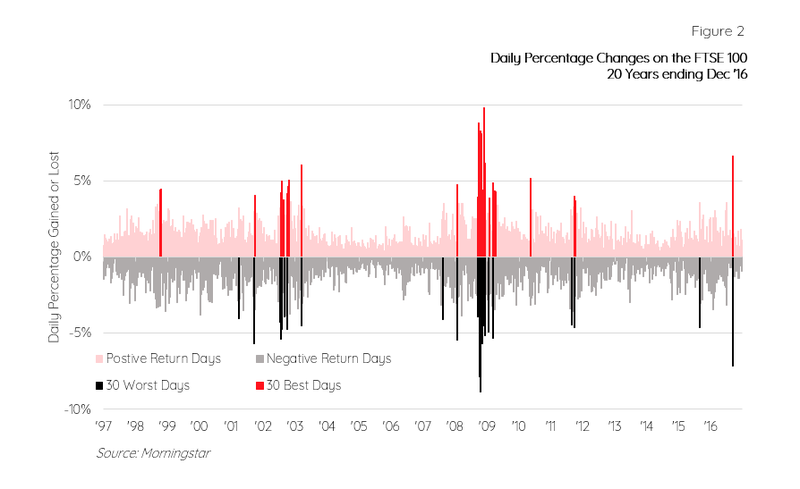 The reason why timing is so crucial is highlighted in the graph below, which highlights the 30 best and 30 worst days for the FTSE 100 in the 20 years to Dec ’16. The majority of the 30 best days fall within a week of the 30 worst days. To benefit from these best days without suffering the worst days, an investor would have to precisely predict when they were going to occur – a fool’s game which most investors would agree is impossible. 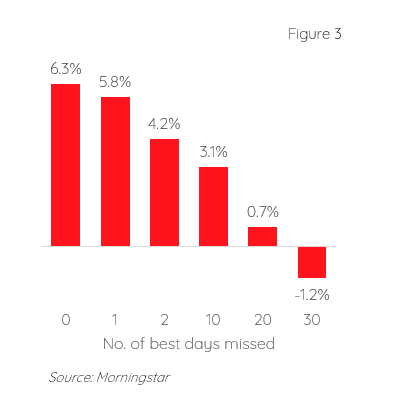 The chart above highlights the impact of missing just a few of the best days in the markets over the last 20 years, emphasising the need to stay unemotional. A heightened sense of worry about potential losses at the start of a downturn may encourage investors to sell, but history tells us that it might be wiser to ignore these emotions and remain invested. The charts above are for illustrative purposes only. Where referred to, ‘stocks’ are represented by the FTSE 100 index while ‘bonds’ are represented by Barclays Global Aggregate Corporate Bond Index. It is not possible to invest in an unmanaged index. The examples are based on hypothetical and simulated modelling which has many inherent limitations and is generally prepared with the benefit of hindsight. There are frequently sharp differences between simulated results and the actual results. There are numerous factors related to the markets in general or the implementation of any specific investment strategy which cannot be fully accounted for in the preparation of simulated results and all of which can adversely affect actual results. No guarantee is being made that the stated results will be achieved. Data sourced from Morningstar, Bloomberg, PIMCO.